Before we get started, tonight our thoughts and prayers are with Paula Aydt and her husband, our own Greg Aydt from Rhymes with Right. Get well soon Paula..we’re all rooting for you. The Greeks, faced with what amounted to an ultimatum from the EU rejected further austerity measures and decided yesterday not to accept the EU’s proposal by a whopping 61%. It’s not hard to see why. Greece’s debt now exceeds 177% of their GDP.They owe massive amounts to their bondholders and other creditors, whom already took a huge haircut for the last bailout. In order to pay the next payment due on what they already owe, they needed yet another bailout and what Greek’s left wing PM Alexis Tsipras called ‘debt relief.’ That essentially means they want EU nations like Germany to pay off part of Greece’s debt. In response,the EU, led by German Chancellor Angela Merkel offered a take or leave it proposal that would have given Greece enough money to pay off the IMF, which will then give them the money to pay the European Central Bank, and so on and so on. But the EU also demanded severe austerity measures to do it, including spending cuts, reforms to Greece’s expansive pension and social welfare system and ‘labor reform’, which means more cuts in civil service jobs. That’s what the EU wanted in exchange for yet another 240 billion euro ($262.7 billion) bailout. To add an additional bit of arm twisting,the European Central Bank (ECB)took the step of cutting of all cash to Greece’s banks, which are dependent on it since they were connected to the system. The banks are now closed, with ATM deposits limited to 60 euros (about $66) per day if you can find an ATM that still dispenses cash. Greeks are reverting to barter to purchase food and ordinary household supplies, and Greek banks are forecast to run out of money totally sometime this week. What’s really going on is sheer politics. 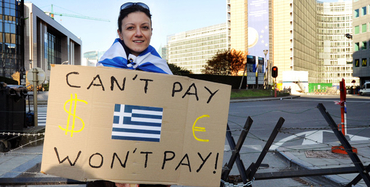 Greece’s debt is never going to be paid off, ever. And the EU knows it. What they’re really after is damage control, AKA a modicum of control over Greek fiscal policy to limit the fallout. The EU is in something of a bind. If they cut Greece some slack, other countries with major debt problems like Portugal, Spain and Italy who received bail outs but are making their payments and coping with austerity are very likely to reconsider making their own payments. After all, if Greece can get away with this, why not them? And there’s also the factor of someone like Merkel having to face angry German taxpayers if Greece slides away from its obligation and they have to pick up the slack once more. By the same token, if Greece is forced out of the Eurozone, it sets a precedent for others to do the same thing and have the whole over-leveraged structure topple over. So the result of this Sunday’s referendum means there’s going to be one of two outcomes. Either the EU will cave in and make a better offer, which is exactly the argument PM Alexis Tsipras used to urge Greeks to vote no. Or the EU will decide it’s had enough of Greece, and Greece exits the euro. Whatever happens, Greece is in for some pain, but I think they’d probably be better off simply dropping the Euro, which is exactly what I wrote in 2012. Dumping the euro and adopting the Greek drachma, which would of course devalue naturally would have several salutary effects once the initial chaos subsided. Greece would no longer be locked into a fixed exchange rate, which would make its exports more affordable and undoubtedly create a boom in tourism, one of Greece’s chief industries. Plus, let’s face it, no one is going to lend the Greeks money or buy their debt for some time to come at anything like decent rates, so they might be better off just wiping the slate clean with a bankruptcy and starting fresh. Not only that, but if the Greeks are smart, they will institute their own form of austerity reforms. The costs of government is nearly half of Greece’s GDP right now (49.3%). A great deal of money could be saved simply be revaluing civil service salaries and pensions in drachmas instead of euros at a government set exchange rate that could be far less than the actual market rate. There’s an interesting lesson to be learned here, with an example from the other side of the Mediterranean. Much more at the link, including why America ought to be paying close attention. In our non-Council category, we had a tie between Robert Tracinski and Benjamin Domenech’s joint effort at the Federalist, Welcome To Culture War 4.0: The Coming Overreach and Israeli author, columnist and thinker Caroline Glick’s The Iranian-American Nuclear Project both submitted by The Watcher, yours truly. Yep I got to break a tie between two great pieces I singled out as Watcher’s picks from some writers I really like even if I don’t always agree with them 100%. Robert And Ben’s piece in the Federalist made a cogent point a lot of people need to hear right now, that while the culture war will continue to be waged by the prog Fascists and we need to be prepared for it, tyrants always overreach and that we need to be prepared to take advantage of that too. La Glick’s essay chronicles the hard facts of the Obama Administration’s caving in to virtually all of Iran’s demands while ‘negotiating’ an agreement that doesn’t actually exist yet after a year and a half of talks, and contains little of anything we were told it would contain back in November 2013. Meanwhile, it’s provided the Iranian regime with two things it really needed…time to work on their nuclear weapons project and billions in cash to keep them afloat. Actually, I recommend you read both pieces carefully, but I went for Caroline Glick’s piece because I think the hard info in it really needs to be out there more, particularly given the way Secretary Kerry and our Dear Leader will try to spin things whether it falls apart with a piece of paper to wave ala’ Munich 1938 or not.